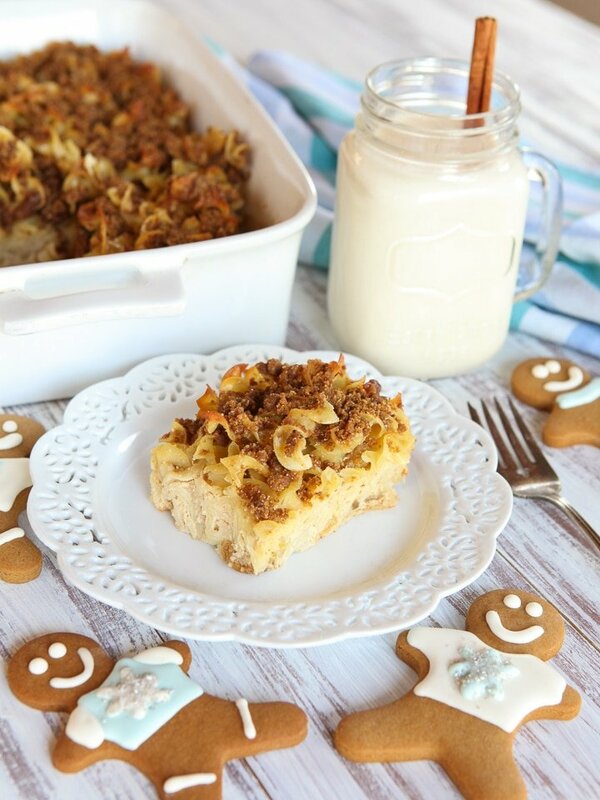 Eggnog Gingerbread Kugel – a sweet Jewish noodle casserole made with eggnog, holiday spices and a gingersnap crumble topping. This easy make-ahead dessert is perfect for a holiday potluck. It’s a decadent indulgence! 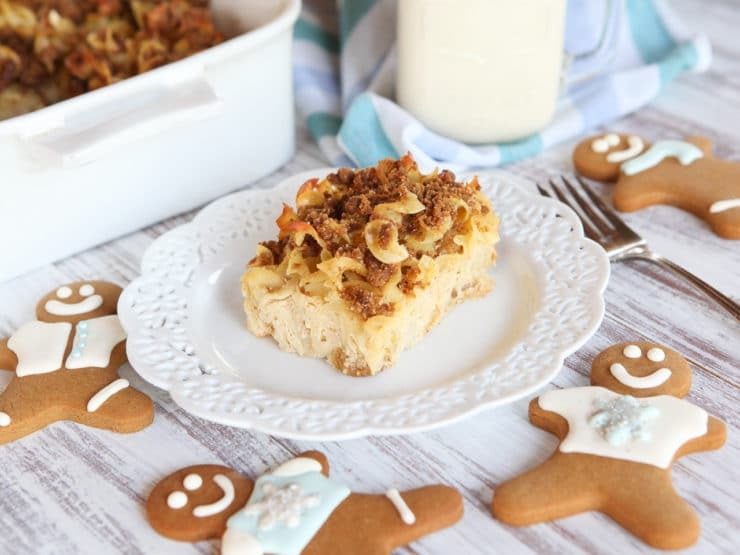 Eggnog, holiday spices, and a gingerbread-style topping give this kugel a unique and delicious flavor. I’m one of those people who absolutely loves eggnog, which apparently isn’t such a rare thing in America. In fact, some Americans love eggnog so much that it once caused a riot. The cadets of West Point upheld an annual tradition of indulging in spiked eggnog during their Christmas festivities. When Colonel Sylvanus Thayer was appointed the school’s new superintendent in 1826, he challenged this tradition by forbidding the consumption, purchase and storage of alcohol at West Point. The cadets refused to have their tradition taken from them and smuggled in alcohol from nearby taverns. Some even traveled across the Hudson River to be sure they had enough whiskey to get them through the night. Thayer, knowing that the cadets might not obey his orders, sent two officers to look out for any unusual activity. Sure enough, the night took a rowdy turn, complete with broken windows, fights and more than a few hangovers. In the end 19 cadets were expelled and, perhaps not surprisingly, West Point no longer hosts a large holiday celebration. The raucous event will forever be known as the Eggnog Riot. This Eggnog Gingerbread Kugel is so delicious, it may very well start a riot in your kitchen! 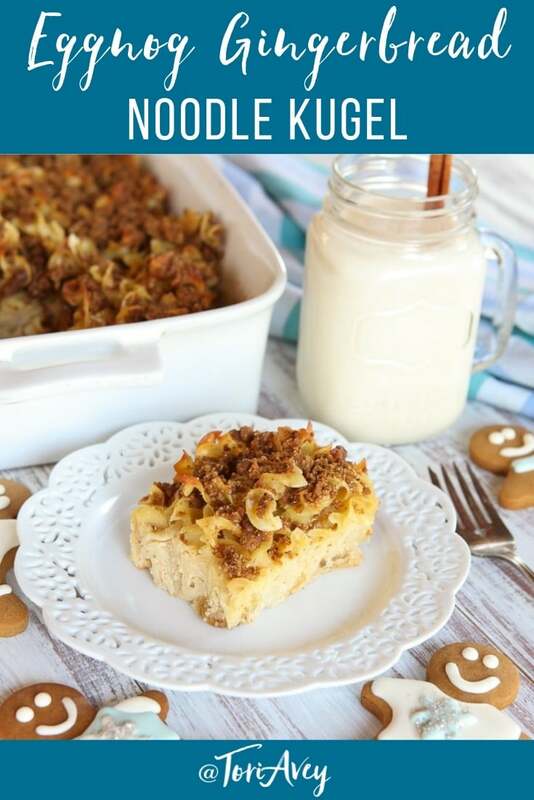 The creamy, dreamy flavor of eggnog takes a basic noodle kugel and makes it into something really special for the holidays. The gingersnap crumble takes it over the top. Happy holidays! 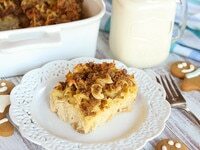 Jewish noodle kugel casserole with a twist! Eggnog, holiday spices and a gingersnap crumble topping from Tori Avey. Preheat oven to 350 degrees F. Bring a large pot of water to a boil. Add egg noodles, stir, and boil until just tender (just slightly al dente). Drain. 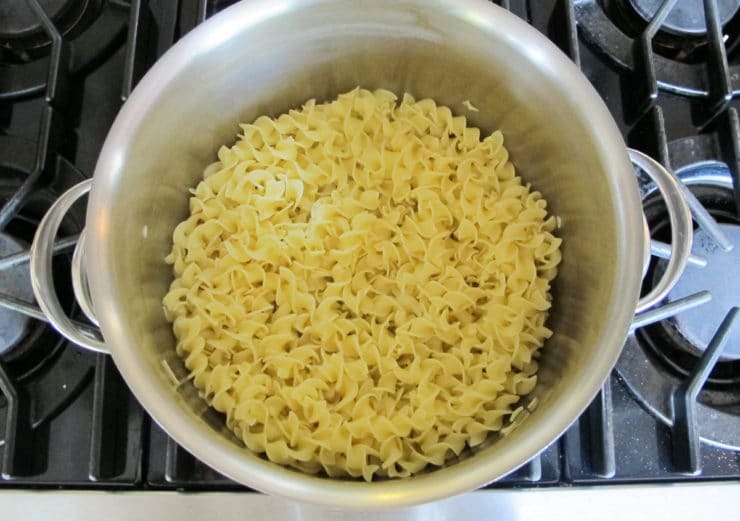 Melt 2 tablespoons of butter in the hot noodles and stir to coat. In a food processor or blender, combine 6 eggs, cream cheese, ricotta cheese, eggnog or soynog, sugar, vanilla, cinnamon, and nutmeg. 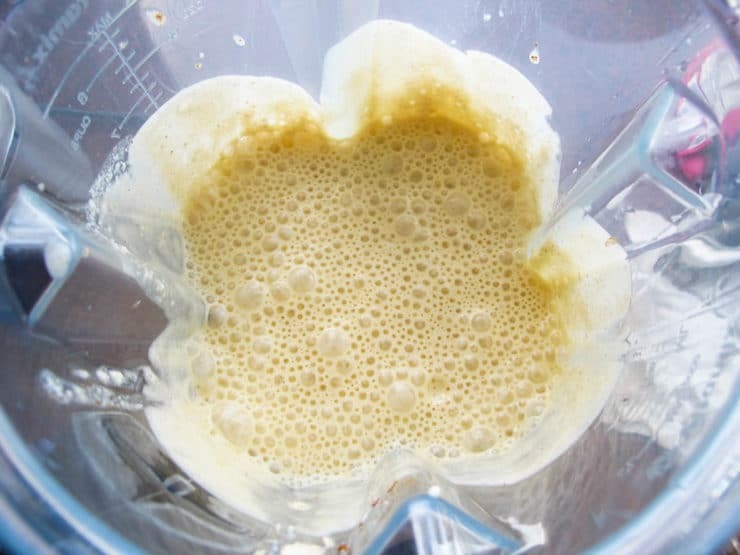 Blend the ingredients until creamy. 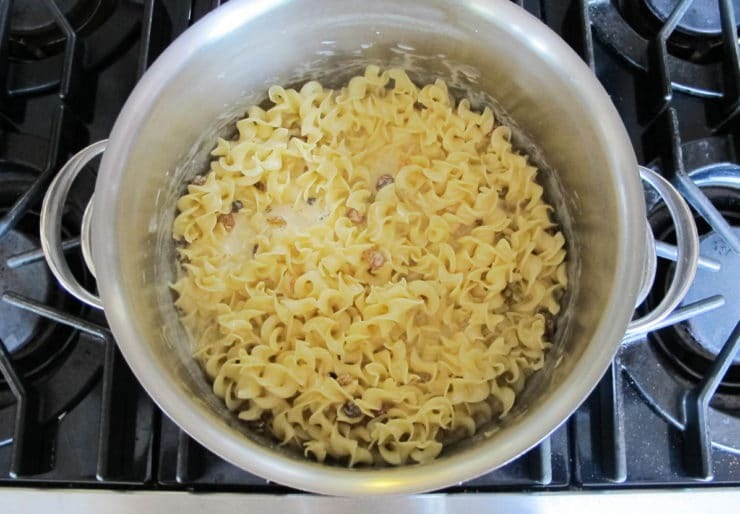 Add creamy mixture to the noodles in the pot along with the raisins. Stir all ingredients until thoroughly mixed. Pour the noodle mixture into a greased 9×13 baking dish. 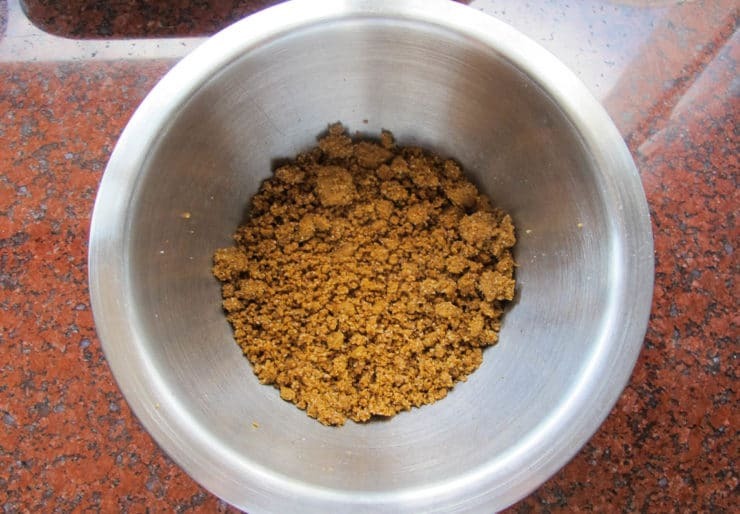 Combine gingersnap crumbs and sugar in a small mixing bowl. Chop butter into small pieces and mix it into the crumbs. Use your hands to work the mixture until it’s crumbly. Sprinkle the topping evenly over the top of the kugel. Cover dish with foil and place in the oven. 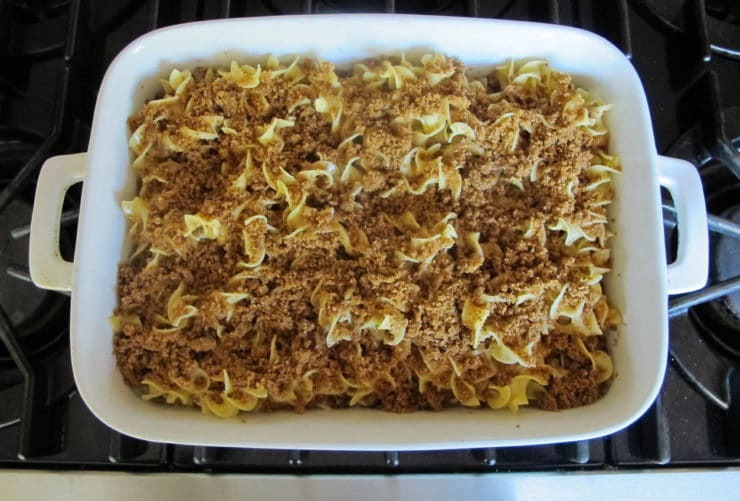 Bake the kugel for 40 minutes. Remove the foil and bake for 10-20 minutes more until the top is golden brown and the center is no longer liquid. May be served warm or cold; refrigerate if you don’t plan on serving it the same day you make it. If you want to reheat your kugel, place it in a 350-degree oven for 15-20 minutes; it will warm up more evenly if you cut it into individual pieces prior to reheating. I am so happy I found your website! 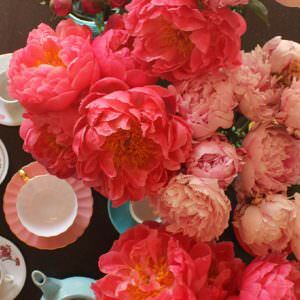 I have signed up for your news letter and have made several of your recipes and enjoyed each and everyone! Many years ago I had a recipe for kugel that called for assembling the ingredients the night before cooking and marinading overnight. In the morning the noodles had absorbed most of the liquid and tons of flavor which made the dish Devine. The recipe was in a small cookbook from Domino Sugar “Sweet Talk”. The book got wet and pages stuck together and I have not been able to find a good recipe until yours. Next time I make it I plan to try marinading to see how it turns out. Thank you for your excellent recipes! I saw this on FB and had to look it up before heading off to the store. I have a very special spice from King Arthur Flour. It is a Dutch blend named Speculaas which they use in gingerbread. I’m going to use it instead of cinnamon and dash of nutmeg. It includes those two plus ginger and some others that add that certain “je ne sais quoi.” I believe the Dutch Windmill cookies are called Speculaas in the Netherlands. We are having an “All Holidays” potluck, and this will be my contribution. I tried eggnog for the first time this year and actually liked it. I experimented by putting it in challah french toast and loved it but I love your idea of adding it to kugel. I’m a huge kugel lover and all of these great flavors make it sound even more delicious. 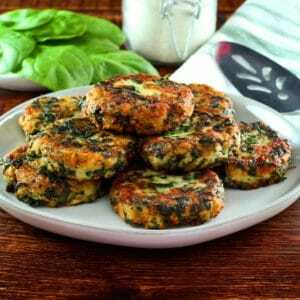 Tori, I have made this recipe twice in the last two days–it is amazing! I did a sugar-free version to take to a Christmas dinner: I replaced the sugar with Splenda, since I figured (correctly) that the texture would not be compromised like it is with cookies/cakes, etc. I substituted sugar-free oatmeal cookies for the gingersnaps, and added nutmeg, cinnamon and ginger to spice them up a bit. I also substituted 1 tsp of rum + 1/2 tsp vanilla for the 1 1/2 tsp vanilla, and added 1/2 tsp of ginger to the creamy mixture. It was a hit! But–because I gave away the entire pan at the dinner, and only got one piece for my husband and myself–I made a second batch tonight. I used sugar and gingersnaps, as called for, but cut the sugar for the topping to 2 tsp. I made all the other changes I did before–the rum extract and the ginger. I just took it out of the oven and it is cooling before I cut it, but it smells absolutely heavenly! I love eggnog and ginger, and kugel, so this distinctive concoction is definitely a keeper for me!! 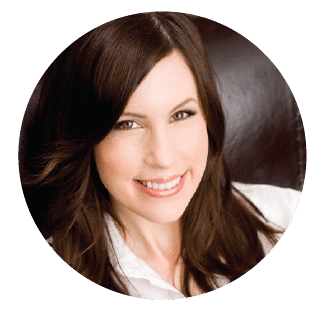 Thank you–I get your newsletter and LOVE your recipes!! I’ve had trouble getting a kugel the right consistency in the past, but this came out PERFECT! I don’t think the eggnog flavor came through real well, but the kugel was still yummy. I’ll use more cinammon next time for backup flavor. I used a good brand name eggnog – not light. Made it today! Delicious:-). I used graham cracker crumbs rather than ginger snaps because my husband prefers the graham crackers. So happy you liked it! 🙂 I love a good graham cracker topping too. Our interfaith family made this for Christmas Eve dinner and it was truly delicious! Going to make this a family tradition, eating it every year during the holidays. Thank you! My daughter, husband, and I had so much fun making this kugel! It’s in the oven now and smells AMAZING! OMG! THAT looks SO GOOD! I may try it for the New Year ? Oh my, this is a must try! I so need to make this! Sounds amazing!?? That looks so insanely delicious!! I am definitely making it! !